Blurex Ultra Slim Case for Nexus 10: designed specifically for the Nexus 10 with built-in sleep/wake feature. It converts into a multi-angle stand too. Poetic KeyBook Removable Bluetooth Keyboard Case: a slim, durable leather like cover for your tablet. You get a removable Bluetooth keyboard. The case can serve as a stand for your gadget. Nexus 10 Cover: the official case for the Neuxs 10. It is ultra-slim and can put your device to sleep (or wake it up) automatically. Poetic REVOLUTION Case: a hybrid case and stand for your device. It improves your grip and offers slip-resistance and impact-resistance. i-Blason Case for Nexus: not only protects your tablet but also has a built-in hand strap. It converts into a multi-angle stand with the groves in the case. Nexus 10 Smart Case: has multiple layers of protection for your tablet. A low profile pocket for your charging cable is included. Amzer Silicone Jelly Skin Fit Case: a highly affordable cover for your Nexus tablet. It keeps your gadget scratch- free and can handle accidental bumps. 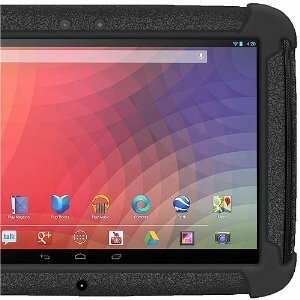 Have you found better Nexus 10 cases? Please add them here.